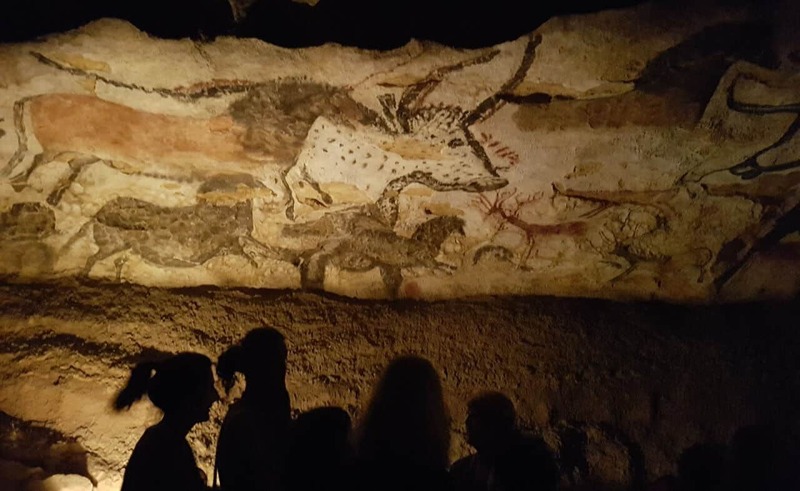 One of the many reasons people travel to France is to see for themselves the Ice Age cave art. Although most are now closed to the public, a number are still accessible – albeit with heavily restricted access. 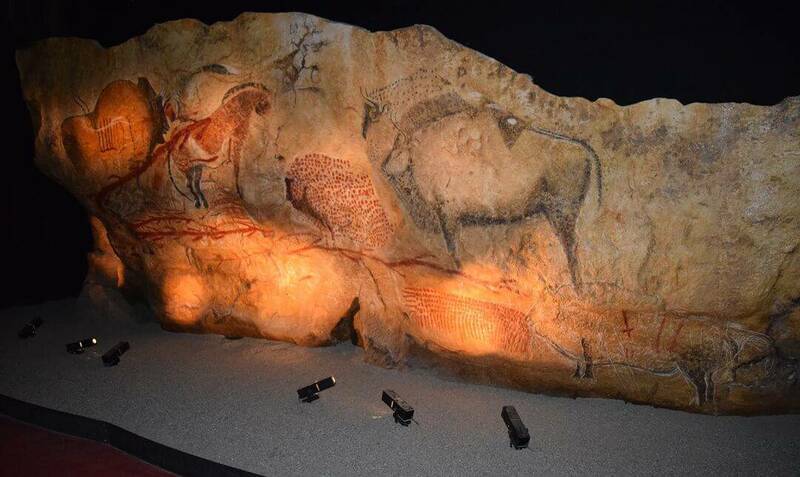 And of course the extraordinary replicas of Lascaux and Chauvet are ‘works of art’ in their own right. Getting to see all of these attractions is something of a logistical challenge. 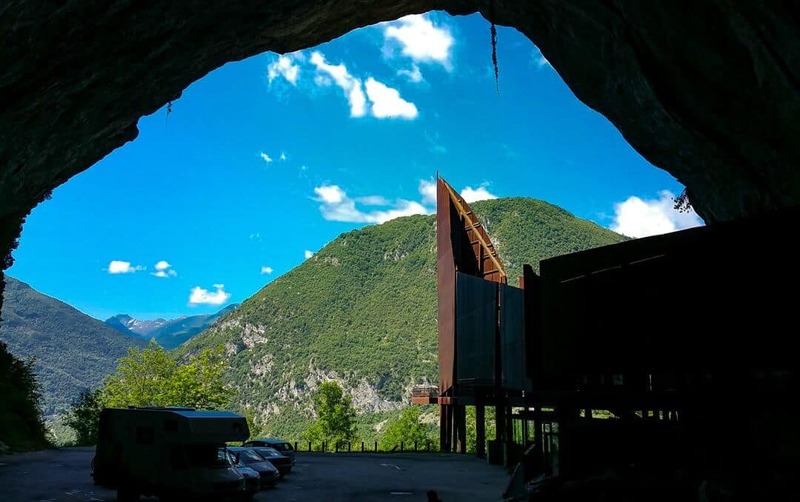 With over two decades of leading tours to the decorated caves in France, Thomas has created an ideal itinerary taking in as many of the sites as possible, sharing his tips for that perfect self guided tour. Visiting Lascaux 2, the replica of Lascaux that opened to the public in 1983. France has some of the finest cave art in the world; certainly the most well known. People come from all corners of the globe to see such sites as Font de Gaume and Rouffignac, Cougnac and Peche Merle, Niaux and Bedeilhac. These sites are, however, in different parts of a large country. Unless you have a lot of time on your hands, getting to see all of the good ones that are still open to the public can be a logistical challenge. Of course, if you enjoy creating itineraries this would be a welcome challenge, with so much archaeology and history to see in France. Most people I encounter though do not have that much time on their hands. Not only do they want to see as many sites as they can in that limited period, when planning their trip they are often unable to gauge what is and what is not achievable. And for various understandable reasons some people simply find planning an itinerary a lot of hard work. In June 2019 it will be 30 years since I first visited around 30 cave art sites of France. Fortunately, I did not have to plan that trip. Since the late 1990s I have been organising and leading groups myself. First my undergraduate students and then later clients from around the world, including Australia, Canada, South Africa and the USA. Also I have created many hundreds of bespoke itineraries for people wishing to visit the caves in France on their own. Although each and every itinerary has been different, I do not think I am being immodest in saying I have learned a thing or two in this area. Following many requests, I have decided to publish the basic outline of my ‘ideal’ itinerary. 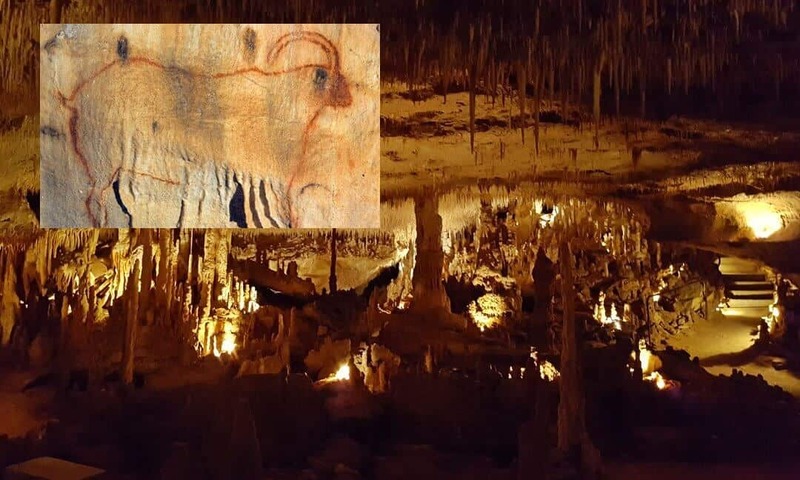 I show how it is possible to see the best cave art in France in a limited time, starting with the replica of La Grotte Chauvet-Pont d’Arc in the Ardèche, heading over to the Pyrénées to see Niaux, and then up to the Lot before ending with a few days in the Vézère Valley for sites such as Rouffignac and Font de Gaume, as well as the Lascaux replicas. Despite offering a tight schedule, there is obviously room for expanding this itinerary to suit your circumstances and requirements. For example, you might have more time available or you might also want to see some of the amazing Roman sites in Provence and eastern Occitanie. In this case you would add more days to the start. If Cathar Castles are your thing, stay a few more nights in Carcassonne. And how long you stay in Les Eyzies will depend on how much you want to see there. Visiting cave art sites and replicas is the focus of your trip. You can hire a car, and drive from one point to the next. This would be a very different itinerary if you had to rely on public transport. You can start in the south and end in Les Eyzies – further details for doing this from Paris are provided. In principle you can reverse the order, but the plans would need some scrutiny. Use this itinerary as a basis for planning your trip alongside my Guide to Cave Art in France. Please do ask any questions you have by filling in a comment at the end of this page – I am more than happy to add a FAQ section as this develops. If you have done something similar or used this itinerary and have a few tips, suggestions or corrections, I know many readers will welcome these. At least twice a year I do a version of this trip, I will update it where necessary as soon as I can. Getting out of the French capital, I suggest getting a TGV from the Gare de Lyon in Paris to Valence. Here you can hire a car. A journey that should only take just over two hours. For example, one published journey leaves Paris Gare de Lyon at 11h07 and gets you into Valence TGV Rhône-Alpes Sud at 13h18. The station is situated a few kilometres outside of the town, with easy access to the motorways. So no need to negotiate getting out of a busy city after getting off the train. As Chauvet is a few kilometres from Vallon Pont d'Arc, this is where I recommend you stay overnight. The drive from Valence TGV station to the Vallon Pond d'Arc area should not take much more than an hour and a half. The geomorphological arch after which the area is know, Vallon Pont d'Arc, near the replica and original Chauvet painted cave. 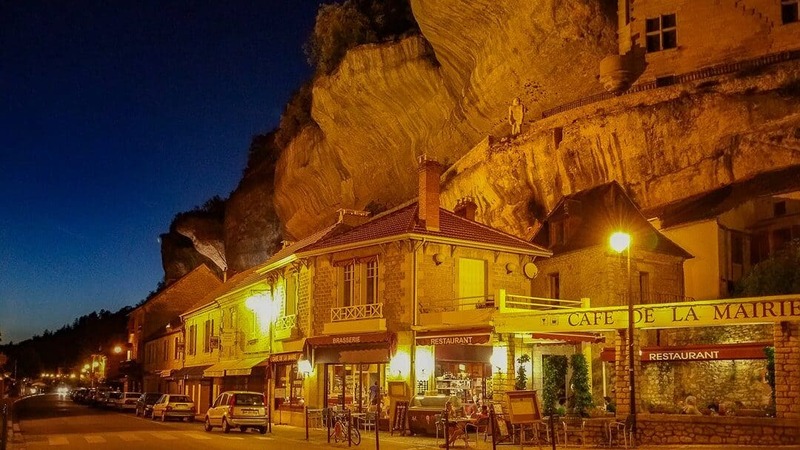 The Vallon Pont d'Arc area has long been a popular tourist destination, and so the choice of accommodation in the area is good (there are over 80 places in Vallon Pont d'Arc area on Booking.com to choose from). My favourite place to stay is the Prehistoric Lodge. Above the banks of the Ardèche River you can either have a lodge/tent or a more hotel-style double room. It is a wonderful place to relax, and they serve very good meals. Just the spot for an early start the next day. 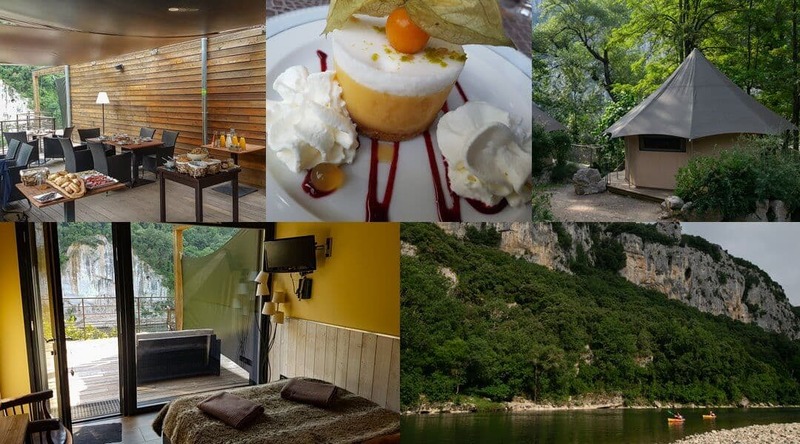 Clockwise from top left, breakfast is served on the terrace with a great view onto the Ardèche River, my favourite - a lemon meringue dessert, one of the tents, canoeists on the river, and the view from one of the rooms. For those interested in seeing a few of the highlights of Provence and the eastern end of Occitanie, and have the option of adding a few days, I recommend getting the TGV to Marseille. Hiring a car there and then make your way up to Vallon Pont d'Arc. A straight-through drive from the airport in Marseilles to Vallon Pont d'Arc should not take you more two hours. And there are many well known sites and attractions to stop off at along the way. For those who like Roman sites, there is Arles, Nîmes with the Pont du Gard and Orange, to name a few. Arles is also a great place to visit for fans of Van Gogh. If you sang the song as a child, you might want to visit Avignon. These are all more or less on the way to Vallon Pont d'Arc from Marseilles. If you are heading up to see the Chauvet replica from Marseille or Nice, and the Prehistoric Lodge does not suit you, I can recommend a stop in Pont-Saint-Esprit - a charming town with many wonderful Medieval buildings including a 14th century bridge over the Rhône River. There are a number of very pleasant places to stay at, with some great restaurants to suit all budgets and tastes. If you only plan on staying one night in Vallon Pont d'Arc, you will want to have early tickets for Chauvet 2 and be on the road to the Pyrénées by lunchtime. 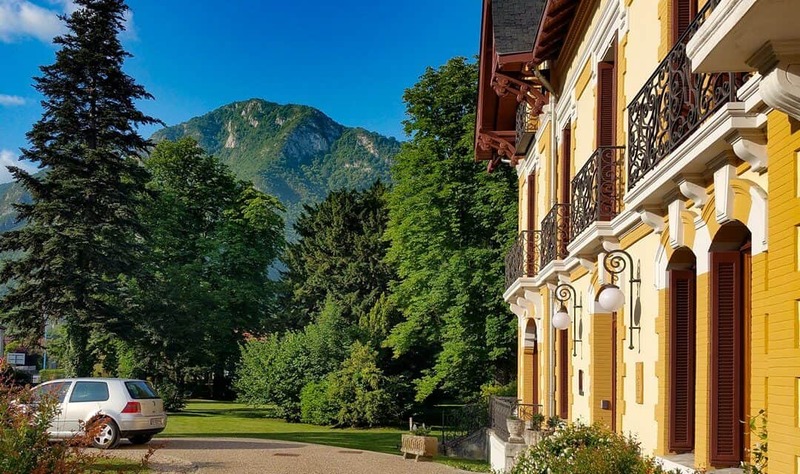 Of course you could stay two nights here: visit the replica, take your time in the interpretative centre, take a canoe ride along the river, or explore a few of the villages. 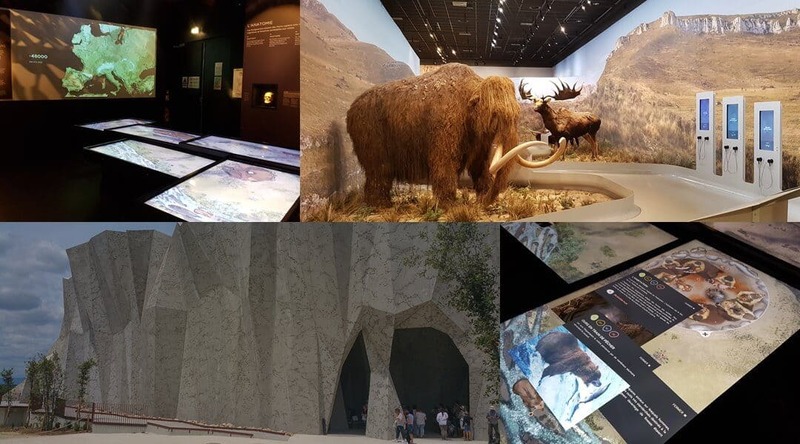 Clockwise from bottom left, the striking structure that houses the replica of La Grotte Chauvet; multimedia and interactive interpretative displays; reconstructions of some of the animals frequently depicted by Ice Age hunters and gatherers; a close up of one of the interactive tables showing the environment around the cave at the time the art was created. You are strongly advised to buy your timed tickets for Chauvet 2 in advance (Official Website). My suggestion is to get your timed entry for as early as you can, and visit the interpretative centre afterwards. The guided tour of the replica is about 45 minutes and, allowing for time to get around the attraction, a further hour at least for the interpretative centre. Going on to the Pyrénées, I recommend staying in Tarascon-sur-Ariège, just under five hours from Chauvet 2 on motorways for which you will pay toll fees. Doing this allows you to get the most of the sites near Niaux. There are a few hotels in Tarascon-sur-Ariège, but the one I recommend that is not too pricey is the Le Manoir d'Agnès. It is in a great location, at only 10 minutes from both Niaux and the Parc de la Préhistoire de Tarascon-sur-Ariège. Just because you are including Niaux on your itinerary you do not have to stay in Tarascon-sur-Ariège. Another option, and one I more frequently take, is to stay in Carcassonne and drive to Tarascon-sur-Ariège for the day - it is about an hour and a half, a bit more between the two. Despite the fact that this is not the most accurate reconstruction possible, Carcassonne in the evening is a pleasure. And truly, I never tire of visiting. Staying in Carcassonne (around 4 hours from Chauvet 2) gives you the advantage of having more time to explore the wonderful walled Medieval city, but the drive to and from Tarascon-sur-Ariège only allows you enough time to take the guided tour of Niaux and spend an hour or two in the museum at the park. There are really so many wonderful places to stay at in Carcassonne, and I have tried a good number over the years, even one of the five star hotels within the walls of the Medieval city itself, Hotel de la Cité & Spa is a must! At the other end is a very good budget option, within walking distance of La Cite, Hotel Espace Cite. If you are going to be in Carcassonne for a few days and prefer a self-catering apartment, you are in luck. There are two options I recommend, both within walking distance of the Medieval city and with great views of the walls. These are Gîtes Les 3 Tours 2 and Gîte les 3 tours 1e étage. Both are run by the same owner, a charming and welcoming host. At first I was worried it would be noisy here - no need! And to have breakfast on the terrace looking at the restored Roman and Medieval walls was heavenly. My final recommendation is quite special. A beautifully restored mansion just on the edge of Carcassonne - L'Orangerie B&B. After a long day in the Pyrénées it was wonderful to sit by the pool sipping an ice cold beer before heading into town for a meal. My favourite restaurant, and many of my clients agree, is the Jardin d'été at 115 Rue Barbacane just below the walls at the north west part. If the garden is closed, the warm cosy restaurant is an excellent substitute. A view of the Pyrénées mountains from Le Manoir d'Agnès in Tarascon-sur-Ariège. The main reason for going to the Pyrénées is to see the cave of Niaux. Not only is the cave art amongst the most spectacular in France, the experience of going deep into the cave is one of the best you will have. If time is short and/or you would rather spend more time in Les Eyzies, you could always head straight to Cabrerets from Chauvet. This is a drive through the amazing Parc national des Cévennes, which will take about 5 hours. This is what I am doing if I am doing a Marseille round-trip - that is, starting and ending in Marseilles. We start with Chauvet, head to Cabrerets and on to Les Eyzies, then to the Pyrénées and then back to Marseille. After a long drive on Day Two, relax by visiting sites in and around Tarascon-sur-Ariège. As with many areas of France, you are spoilt for choice, from the Stone Age to the Medieval period. Looking out of the vast, modern-day entrance to the cave of Niaux on onto the foothills of the Pyrénées mountains. Tickets for the guided tour of Niaux can be booked in advance online. If you require the English tour you are quite restricted to one tour per day. For example, currently in April there is only one tour at 11h00, for May, June and September there is also only one tour but at 13h30, during July and August there are two English tours each day at 09h45 and 12h15, and there is one tour in October in English at 14h15. But check, as these may be subject to change. So your day in and around Tarascon-sur-Ariège will be largely dictated by when you are travelling and at what time you can get on a guided tour. I strongly recommend visiting the Parc de la Préhistoire. The park has some great reconstructions of hunter-gatherer life, but it is the museum that is a must. Other caves to consider, time of the year permitting, are Bedeilhac, Mas-d’Azil and La Vache. Replica of the main panel in the cave of Marsoulas, at the Parc de la Préhistoire. Drive to Cabrerets in the Lot Department - the best base from which to visit Pech Merle, that wonderful cave with spotted horses. As this at most a three hour drive, you could stop for a few hours in Carcassonne. Stay for lunch and try some cassoulet, a local dish. Mirepoix is another beautiful Medieval village to stop in. The restored Roman and Medieval walls of Carcassonne. Cabrerets is a couple of kilometres from Pech Merle. So ideally situated for an early morning start at the cave. My hotel of choice here is Hôtel Restaurant des Grottes du Pech Merle. I have stayed a number of times, and I even swore never again. But it has recently (2018) had a new lease of life with new management. And I do not have any reservations in recommending it. They have an excellent menu for evening meals, serve a great breakfast, all on a terrace over looking the Célé River. Pech Merle is only a few kilometres from the hotel in Cabrerets. Book your ticket in advance for an early guided tour. Do not worry if you can only get a French tour, as you will be given an English handout, which is in many respects better than the commentary. The guided tour lasts the usual 45 minutes. From here head to Cougnac, which is only open in the afternoon at certain times of the year. The drive between Pech Merle and Cougnac is about an hour. Either have lunch in the beautiful town of Gourdon, or take a picnic to a small lake on the road between Gourdon and Cougnac (10 minutes at the most). There are two caves at Cougnac, the first is noted for its geological interest - there is not art in this cave. The second has an extraordinary panel of animals. The experience visiting these two caves is one of the best, if not the best in France. The geological cave with its magnificent stalactites and stalagmites and an ibex from the painted cave at Les Grottes préhistoriques de Cougnac. There are a number of hotels in Les Eyzies, all within walking distance of all the main points of interest, including Font de Gaume. The four star Hôtel Les Glycines is at one end of the town, while the two star but so charming Le Moulin De La Beune is at the other end of town. In the thick of it, so to speak, is the very stylish La Maison - which has an excellent restaurant. But, on my last visit in October 2018, I fell in love with Moulin de Pagenal. A small self catering cottage that is 2.2 kilometres from the centre of town. Les Eyzies, the town that styles itself as the world capital of prehistory. You can spend a few days here, or you can spend a week. And there would still be a lot to return for. One of the reasons I choose Les Eyzies is due to the difficulties in getting tickets for Font de Gaume and Les Combarelles. Unless you are part of a tour, there is no longer any option to buy tickets in advance. As the limited number of tickets are sold on a first-come-first-served basis, to see both sites on the same day (and avoid standing in the queue twice) you need to get into the queue early - getting tickets for Font de Gaume and Les Combarelles. For me then, being bases in Les Eyzies is the ideal option. All this aside, it is just a very pleasant place to stay in. Take a stroll down the main street through Les Eyzies-de-Tayac on a clear early summer evening. There is so much to see and do in and around Les Eyzies, how long you stay here will depend on how much you want to see and do. Besides the decorated caves there are a lot of archaeological sites of interest, as well as many Medieval sites. 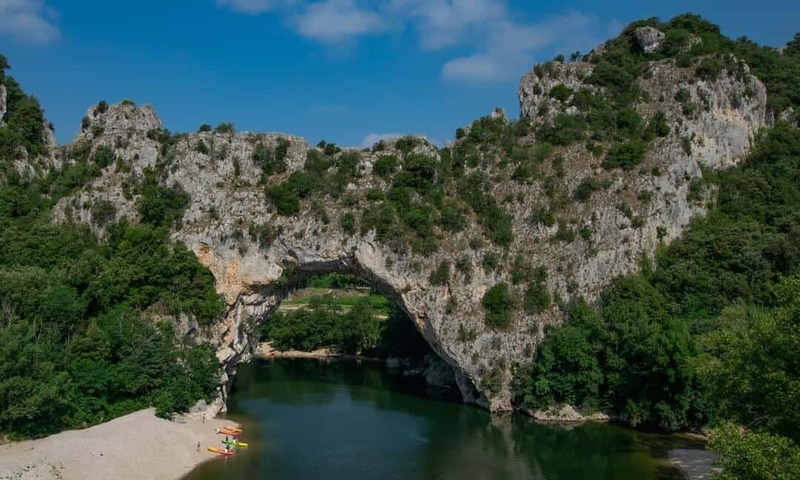 And there are many other recreational opportunities too, such as canoeing down the Vézère River, walking and hiking, and exploring the gastronomy of the region. Start your planning with my Guide to Les Eyzies. 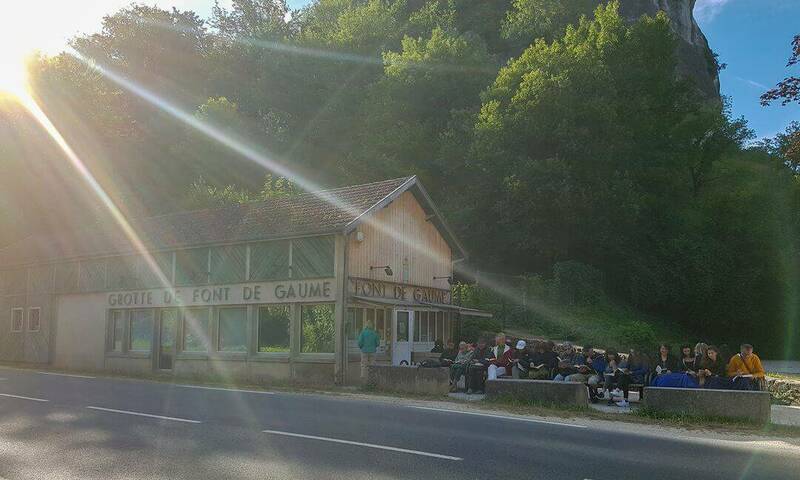 Queueing for tickets at the Font de Gaume ticket office around 07h00 in June. One of the most beautiful Medieval towns in France. Not surprisingly, frequently used in films. The Roman Domus (townhouse) in Périgueux. And while you are in town, visit the Périgord Museum of Art and Archaeology. On either side of the Dordogne River (the border between the French and the English at times during the 100 Year's War) are some magnificent castles - two that are a must are Château de Beynac and Château de Castelnaud. Stone Age hunters and gatherers were not the only people in the area to make living in cave an art form. During the Medieval period many communities used open rock shelters to build their settlements. Three good ones to visit are: La Roque St. Christophe, La Madeleine and Maison Forte de Reignac. All of which are on the road between Montignac and Les Eyzies. Looking down onto the courtyard of the Roman domus of Vesunna in the modern-day town of Périgueux. Time to leave? Heading back to Paris? You can either drive east to Brive-la-Gaillarde or Souillac for a train to Paris. Both towns are on the same line, and both similar distances from Les Eyzies - 1 hour 10 minutes and 50 minutes respectively. Choosing between the two would be based on returning your car rental. Or, head west to Bordeaux. This is a much longer drive - two hours - but you can get a much faster train to Paris. There is also an international airport to fly out of. 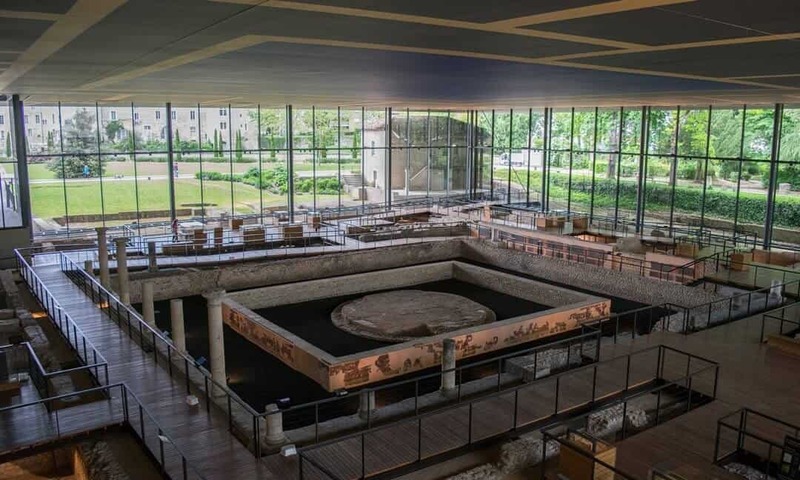 Or you might just want to visit Bordeaux - in which case do not miss the Musée d'Aquitaine, which has some excellent prehistory exhibits. 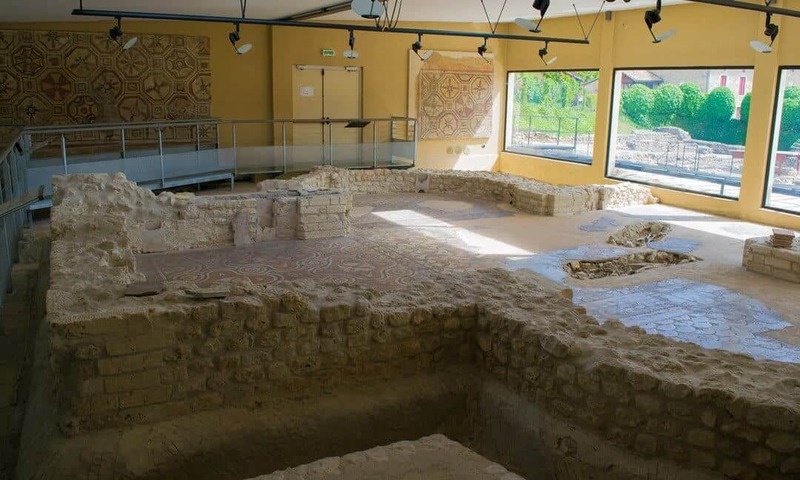 On your way to Bordeaux, consider stopping at the Montcaret Roman Villa. The Roman Villa in the village of Montcaret.